The Art Exhibition is being held at the Alliance Francaise located upstairs the Old Public Library. It features work from four past St.Vincent Community College art students, Kamara Brackin, Dane Jack, Roland Layne and Dujon Windsor. âWe realize that the human resources is a major asset,â stated Kirby, while adding, that Clico is committed to education and promoting the development of young people. Clico gave EC$4500 to the art exhibition. Kirby pointed out that her organisation is very pleased with the fact that art is now being offered at AâLevel. She said that they were able to identify with the exhibition because of the way it promotes creativity and talent. 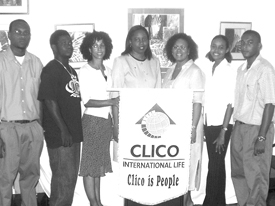 Over the past years, Clico has been giving significant attention to education. A release from the companyâs website said, âour continued involvement in Junior Achievement and our staging of the âPut it in Poetry Competitionâ allowed us to meet the practical and creative needs of our young peopleâ. A CLICO calendar is also produced. It is described as a kaleidoscopic journey throughout the Caribbean – through the eyes of Caribbean artists. Kirby said that Clico will look closely at the art work on display. Clico also sponsor a number or regional sporting events.